Maybe eventually have several games in this world? You will be able to still get some lore through text (libraries, etc), but it won’t be a crutch or the only way. Shissar nearly conquered Norrath by laying waste to many Elven cities.. Elves only came out due to prior alliances. “Just because you’re familiar with a term does not mean we’re treating it the same way!” While Koada’Dal was a race in EQ and EQ2, it is “a sect of Elves” in EQNext. There’s only one Elven race but several sects. Takish Age: Elves have a unique form of magic, “High Magic”, even dragons were afraid of it. The Takish Empire oppressed other races. Takish Age: Dragons were isolated… Elves couldn’t control dragons but drakes, wyverns, etc could be. They distanced themselves. The Sundering: Takish’Hiz was destroyed. Elves didn’t know what caused it, but a teleportation spire imploded. High Magic became broken. After The Sundering, an area called “The Ashfang” is what is on top of the ruins of Takish Hiz. To buy time for the withdrawal they make a final stand at Bastion, “Fall of Bastion“, led by Caramor Thex. The “Last Stand of the Teir’Dal“. Plan is those who are fleeing will go to Kunark. Dal Era ends; Combine Era begins. 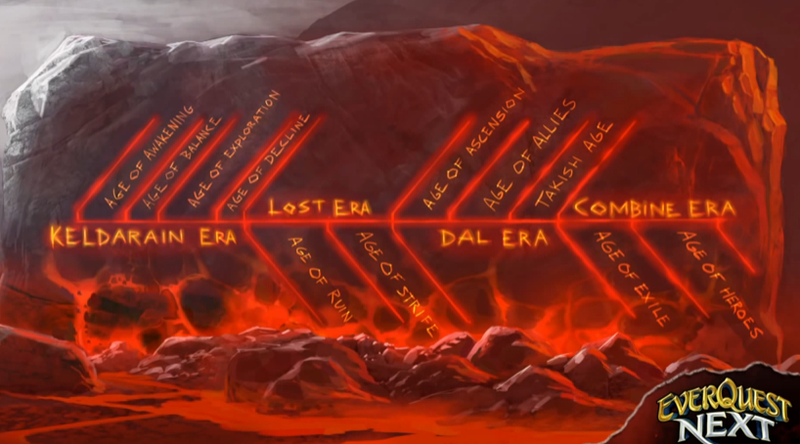 Age of Exile: Beginning of Combine Era. (spoilers!) Stand at Bastion is successful but cost is very high. Some of the Combine gets away and sails to Kunark. At the beginning of the game no one alive has ever seen a God of Norrath. The Seraphs: Eight gods with roles in the world.. while familiar with names there’s also new things and influences from other gods combined.